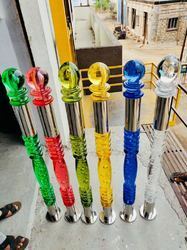 Established as Sole Proprietorship firm in the year 2012, at Rajkot (Gujarat, India), we “Parth Enterprise” are a renowned manufacturer of a qualitative assortment of SS Railing, Acrylic Rod, Acrylic Railing Stand, Piller Balls, etc. Our offered range is widely acclaimed for its features like elevated durability, optimum strength, fine finish, etc. Under the headship of, “Mr. Sailesh Virani” (Proprietor), we have achieved a noteworthy position in the market.